Congratulations to Dr Camille Short who is a 2016 South Australia Tall Poppy Science award finalist. The award recognises intellectual and scientific excellence of young Australian scientists. Camille is a NHMRC Early Career Post-Doctoral Research Fellow at the Freemasons Foundation Centre for Men’s Health. 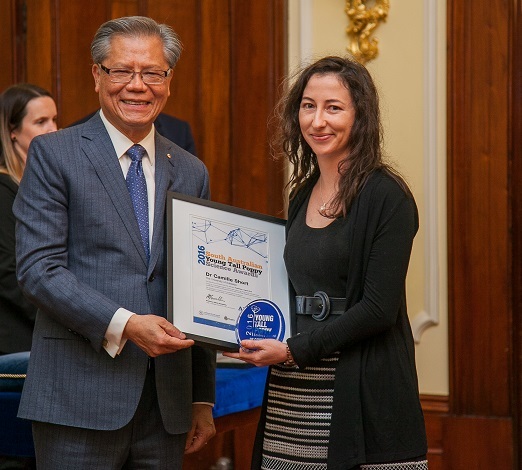 Camille received her award from His Excellency the Honourable Hieu Van Le AC, Governor of South Australia at Government House on 1 August 2016 at Government House. Camille received the award for her achievements in the field of behaviour, public health and physical activity promotion. Specifically, her excellence in research developing, evaluating and advancing population-based behavioural intervention approaches to physical activity promotion, especially those utilising eHealth technologies and targeting at-risk and under-served population groups, such as cancer survivors, those living outside of urban areas, and men, has been recognised. Over the next year, as a condition of the award, Camille will be busy participating in science communication activities targeting school students to promote study and careers in science and also promoting science to the broader community. The Centre now boasts two Tall Poppies amongst its ranks, our previous one being Dr Luke Selth (Co-Leader of the prostate cancer research program) in 2013. This entry was posted in News, Research and tagged awards, physical activity, research excellence, tall poppy, young scientists. Bookmark the permalink.